The Clover App was developed especially for iPhone, iPad and Apple Watch and challenges the leading online dating sites in its simplicity. Clover.co have created a free to download dating app that is easy to use, makes swiping and meeting singles fun, and is a true competitor to every dating app out there. In our review of the Clover App we explain why everyone who’s looking for love, casual dating, a relationship, or romance should definitely download the Clover dating app to their mobile or tablet. The App is not available at this time for Android phones, tablets and mobiles. The ease of use and the great design of the Clover App give it a premium online dating experience which is handy for any mobile phone or tablet running iOS. This free singles dating app is full of features which makes finding local singles in your area who are looking to go out on a date, enter into a relationship, fling, or find love very simple and easy. 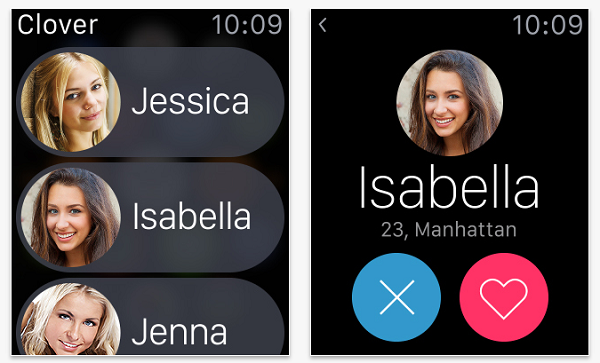 The big plus for iPhone, iPad or Apple Watch users is that this huge online social dating community has developed its own unique PAIR© algorithm, making its intuitive swipe to meet feature much more reliable. This advantage allows users to cut through much of the clutter and find compatible matches through their mobile in a much easier way. Currently the app is only available to iOS mobile phones and tablets. If this dating app wasn’t what you were looking for we strongly urge you to take a look at our reviews of more Android dating apps and iPhone dating apps which you can download here also. The Clover mobile site offers a great way to learn more about the app, however, it does not offer a way to try out Clover on your phone or tablet. Although the mobile Clover site is written in HTML 5 and is responsive (making it compatible to all mobile devices including Android, iPhone and all iOS phones and tablets), it does not offer a way to login and use all the features which the Clover App provides. It does offer a way to download the dating app via iTunes and a way to get it using Text message, but actual login and dating is not enabled through the mobile site. View full-screen photos of users in your area. 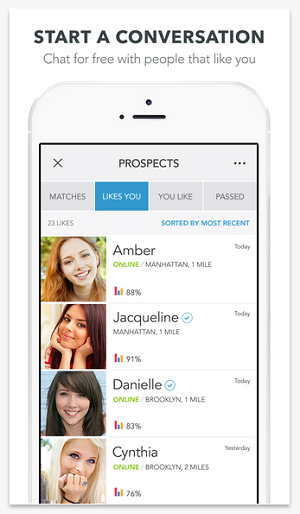 Organize your matches according to prospects. Use of the on-demand dating feature. Finding local singles events, parties and online meetups. Use of many filters to find your perfect match. 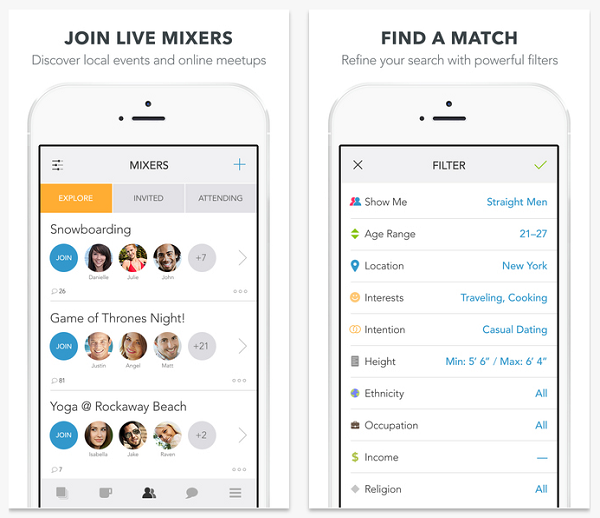 Meet single men and women with your common interests using the Join Mixers feature. Upload up to 100 profile pictures. Filtering options according to intention include: casual dating, serious relationship, hooking up, or making new friends. Option to include Instagram or Twitter on your profile page. Search filters include: body type, height, ethnicity, occupation. Get to see who likes you and keep track of who you’ve liked. Import photos from your iPhone or Facebook. Limit who is eligible to contact you based on location and age. Ability to share videos, photos, and audio messages. Ability to send unlimited gifts. Ability to access and read receipts. 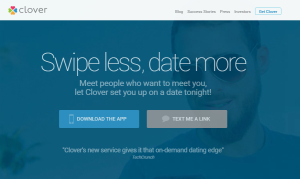 New members of the Clover dating app can try out a Premium account for 7 days for free. 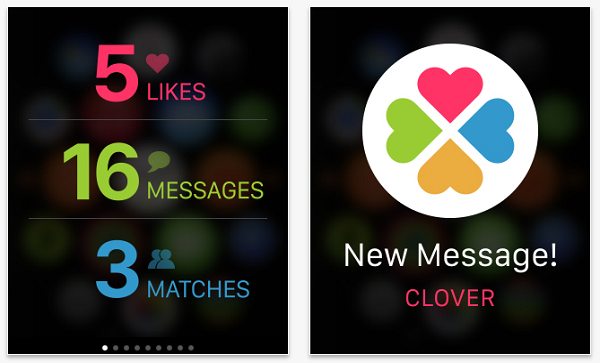 For singles who own an iPhone, iPad or Apple Watch the Clover App is what they should download. 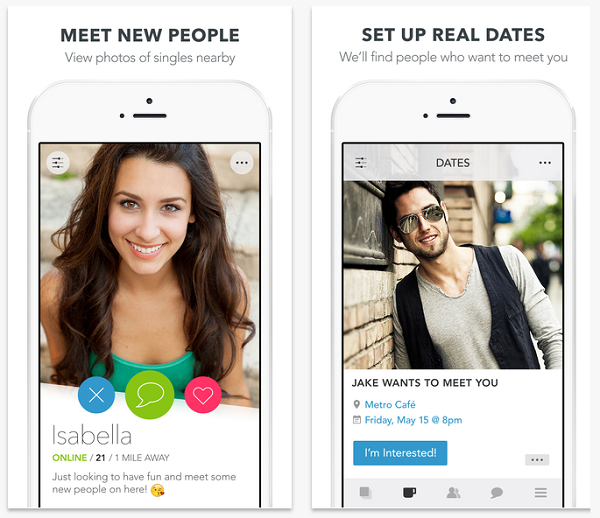 This dating app outperforms the competition in regards to free features and is a great application to meet singles who are looking to date online and do it through their mobile or tablet. The Clover mobile app is free to download and install and is the home of one of the largest singles dating communities in the world. The social dating features are great! The app is easy to use, safe and most of all fun. Take it from us, you need to get this singles dating app if you are interested in making new friends, entering into a serious relationship, finding love, or just date online. 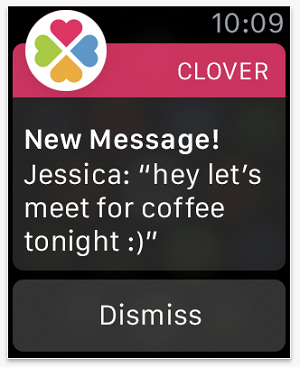 We highly recommend you to download the Clover App to your iPhone, iPad, or Apple Watch. There is no Clover Android app available at this time. Will the Clover app work on iOS version 6.0? As with all the apps we review, we highly recommend to upgrade to the latest iOS operating system which the provider details in its app specs. Lower versions might run the application but can become unstable. Why isn’t there a Clover app for Android? Honestly, we don’t know. We think it would be a great initiative by Clover to add an Android version as one of its dating apps, however, currently there is none available. Can I sign up to a Premium Clover account just to get the 7 free days promo? As with all dating app promotions we list, we strongly urge you to contact Clover to receive all the details as they might change according to the company’s policy.